The Innishannon Steam and Vintage Rally is the largest steam and vintage rally in Ireland and is held in aid of the Irish Cancer Society. 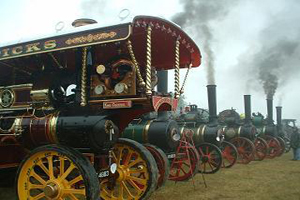 Over 1,000 exhibits will be on show including steam engines, tractors, military vehicles, oil engines, fire engines, motor cycles, lorries, vintage farm machinery, fairground organs, trade stands, amusements, a pets’ corner, sheep dog demonstrations, live music, set dancing, rural crafts, book stalls, Sheep Dog Trials and more. The rally, which is held over two days, is a unique experience where visitors get to see machinery, traditions, demonstrations and items from the past. During a stroll around the event field you will come across many great treasures and learn a thing or two!